27 November 2018 (Toronto, ON) – Anthem Legacy, an imprint of ole label group, continues the rich musical legacy of Stompin’ Tom Connors with the release of Unreleased Songs From The Vault Collection Volume 3 on December 7 via Universal Music Canada, the country’s leading music company. The Canadian musical icon passed with 120 recordings in what he referred to as “The Vault”, in order to safeguard against the possibility that he should at some point find himself unable to continue in the studio. 14 new tracks from this collection will be available featuring special guest artists: JUNO Award-winners The Sheepdogs, CCMA Award-winners The Washboard Union, JUNO Award-winning fiddle virtuosos Natalie MacMaster and Donnell Leahy, JUNO Award-winners The Good Lovelies, JUNO Award nominee Royal Wood and Human Kabab. 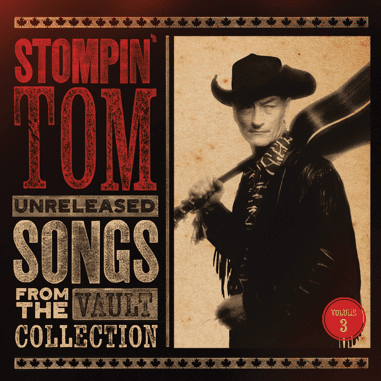 The songs included in the Stompin’ Tom - Unreleased Songs From The Vault Collection Volume 3 are written by some of Tom’s favourite singer-songwriters that inspired him over the course of his life and career. Classics including: Hank Williams’ “So Lonesome I Could Cry” feat. The Washboard Union, Russ Morgan’s “Cruising Down The River” feat. The Good Lovelies and Don Gibson's “Oh, Lonesome Me” feat. Royal Wood, are covered by Stompin’ Tom with his signature vocal style and guitar. With his home spun and fiercely patriotic brand of music, Stompin' Tom's legacy includes Canadian country hits: "Bud the Spud", "Luke's Guitar", "Sudbury Saturday Night", "Big Joe Mufferaw", "Ketchup Song" and Canadian anthem "The Hockey Song". Stompin' Tom's accolades include JUNO Awards for Best Male Country Singer (1971 - 75) and Country Album of the Year (1978), the East Coast Music Awards Lifetime Achievement Award, SOCAN National Achievement Award (1999), SOCAN Lifetime Achievement Award (2009), the Governor General's Performing Arts Award (2000), Toronto Musicians' Union Lifetime Achievement Award (2011), was recently inducted into Canada’s Walk of Fame (2017) and the Canadian Songwriters Hall of Fame in 2018 for “The Hockey Song”. Listen to Unreleased Songs From The Vault Collection Volume 3 here.